Over 2 million properties in B.C. have a new assessed value this year. B.C. Assessment put a dollar value on 2,044,482 properties in this province last year. It's a large number, and the sheer volume of data about B.C. property values that comes out every year at this time can be overwhelming. But aside from the fact that Chip Wilson's house continues to be astronomically valuable, here are a few other key facts to take away from this year's release of property data. 1. Condos are up, but detached homes are stagnant. 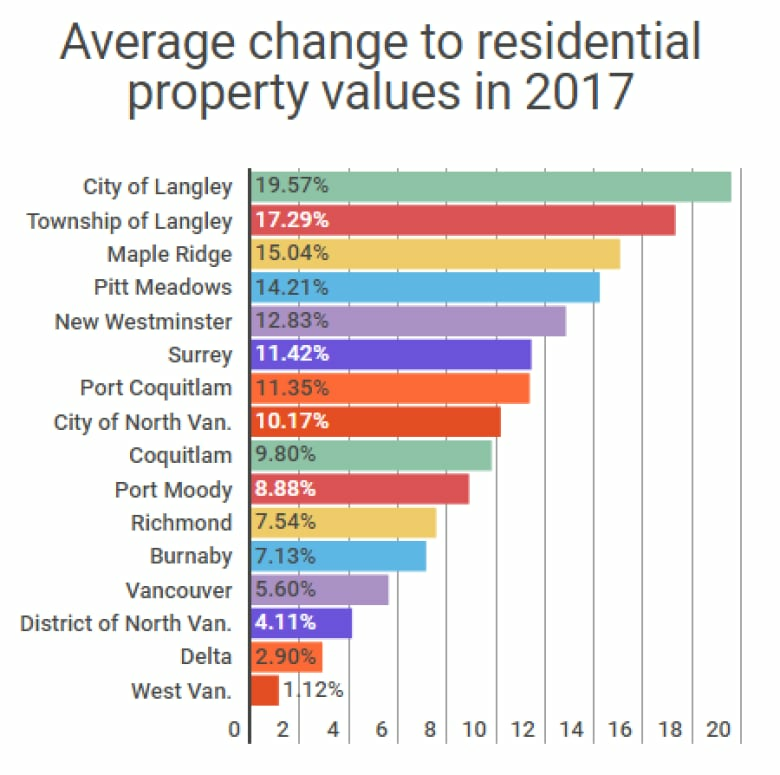 For the first time in years, many single-family homes in Vancouver, the North Shore, Burnaby and Richmond went down in value — some by as much as 10 per cent. It confirms what figures have shown over the past year: The market for higher-end homes stagnated in the last half of 2016 and in 2017, following months of explosive growth. But apart from detached homes in specific areas, the rise in property values continues unabated throughout the Lower Mainland. "When you look at Richmond, there's been no changes in the single-family assessed values, yet the townhouse market has gone up 15 to 20 per cent, and condos are upwards of 35 per cent," said Tina Ireland, an assessor with B.C. Assessment. "We reflect market conditions as of July 1, 2017, and there appears to be less demand for the single-family." 2. Vancouver Island is a hot market. There have been some suggestions that the property value boom in Metro Vancouver has created a spillover effect into smaller, more affordable communities — and the new figures show there might be some merit to that. There were 39 municipalities in B.C. where the average assessed value of residential properties rose more than 15 per cent in the last year. Just three of them were in Metro Vancouver, but 20 were on Vancouver Island. 3. Do your homework before appealing. Between one and two per cent of people file an appeal with B.C. Assessment every year (the deadline is Jan. 31), but property tax agent Paul Sullivan said people shouldn't file one without doing careful research ahead of time. "It can end up being very time-consuming and a costly experience if you don't do your homework in advance," said Sullivan, adding that he doesn't see many people win cases. "Just because it doubled doesn't give you an appeal." UBC economics professor Tom Davidoff said appeals are especially tough for people who live in densely populated areas. "If you've got a condo in Vancouver, I think they're going to get it pretty right, because there's so many homes they compare to yours, but out in the hinterlands, it gets thinner, and you have to believe if your home is unique in some ways, that they could botch the assessment." 4. Remember, your assessment increase isn't the same as your property tax increase. "When your property value rises or falls, that doesn't really drive your property tax bill," said Davidoff. Instead, property taxes are based on the change in assessed values of the homes around it. If your property value goes up significantly more than the average increase in your municipality, your tax bill will see a significant hike as well. Davidoff predicts that condo owners will pay a greater share of property taxes than single-family owners in 2018 as compared to 2017. What will, or should, Burnaby do with its $1B reserve fund?